Once dubbed the “Indian Accenture”, being the Indian heritage outsourcer with the high-end reputation, the firm now finds itself enduring, perhaps, the most difficult period of its history – and it could be poised to get a hell of a lot worse. Vishal Sikka brought energy, fresh ideas, hope… and a Silicon Valley mindset to its leadership when he came aboard amidst his Design Thinking and jeans-to-work attitude just three years ago. However, all Sikka’s energetic ideas and innovations have been largely forgotten over the past year, as the public spat with Founder Narayana Murthy gathered irritating momentum and completely slammed the brakes on the momentum Sikka had sparked. Sikka had woken Infosys up to its potential and the Founders were more obsessed with his use of the corporate jet than making the acquisitions the firm needs to be competitive. From the poster boys for innovative offshoring, epitomized in Thomas Friedman’s seminal “The World is Flat” through to the constant public interventions in corporate affairs by Murthy, Infosys has had a bumpy ride over the last decade of its short history. And to magnify its issues, all of Murthy’s interventions have been played out in public, with the Indian press the grateful recipient of endless reams of news fodder being provided by this corporate soap opera. So what are the lessons that can be learned from all this? Murthy is the dominant father figure of Infosys and he has made that very clear with his actions. As founding CEO, he is synonymous with the early success, the culture, but more crucially, with the decision-making at Infosys. When SD Shibulal, another of the founders, took over it was difficult for him to step out of Murthy’s shadow. 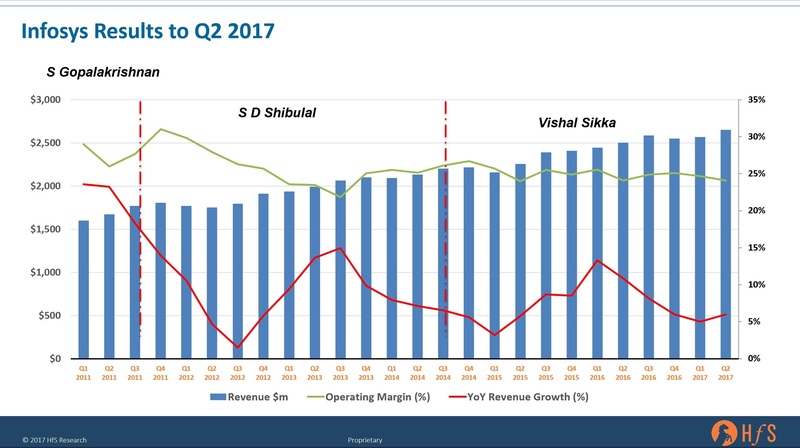 Shibulal’s “Infosys 3.0” strategy was designed to address the over-dependence on the US market (see interview) and rebalance the portfolio by building out IP-based platforms, namely the EdgeVerve portfolio. But he took also the bold step to sign the first Intelligent Automation partnership with IPsoft at the time. Yet, the sales engine continued to stutter which remained the dominant feature of Infosys recent history. This provides the background to the stage on which Vishal stepped, when he was appointed CEO in June 2014 (see post). Vishal was not only the first “outsider” but more importantly not part of the Founders’ generation to take over the reins at Infosys. Being Indian, yet working in California with a strong product background from his time at SAP he ticked a lot of the boxes in order to return Infosys to its erstwhile glory as the beacon for innovation that Thomas Friedman had so eloquently and prominently described. Vishal’s strategy focused on aligning Infosys around automation and AI to re-emphasize the heritage in innovation and Design Thinking, but also to boost the balance sheet as the industry is going through the secular shift towards non-linear growth and outcome based offerings. This was underpinned by an influx of executives from SAP meant, in particular, to help drive the platform and product business. However, the narratives around automation and AI were never succinctly explained and, more importantly, not driven consistently through the organizations. For instance, the teams at EdgeVerve were waiting for guidance from the teams at Mana and vice versa. Without consistent narratives, it was difficult for the sales teams to leverage those capabilities in client discussions. Similarly, Mana was announced with great fanfare as the answer to all automation challenges. What Mana actually is, is a compelling analytics engine. It took another Confluence (Infosys’ main customer event) this year to finally launch a holistic automation framework called Nia. But at this year’s Confluence, Vishal appeared to HfS as being despondent and at times disconnected leaving us to speculate that he might resign or be pushed to step aside. Yet, when he did at this conference an AI tutorial, he appeared to have his old sparkle back. Innovation and discussions with thought-leaders seem to be his passion. And his passion offered something different to an often guarded corporate world. Undoubtedly, current clients will have questions about where this leaves them. Not only was the firm’s latest CEO the driving force behind the firms shift to analytics, automation, and AI, but Vishal’s appointment also saw the CEO’s office take personal responsibility for key clients in a bid to strengthen relationships and develop and solidify revenues from current client engagements. The whole corporate strategy will change dramatically, should the new incumbent come in with different ideas, and in the process likely shake and disrupt progress to solidify client relationships. Infosys has to reignite the sales and marketing engine and prove it has genuine distinctiveness when competing with the likes of Accenture, Cognizant, TCS, HCL and Wipro. Clients need to know what Infosys stands for, and why they should pay the top dollars to invest in this company, when there is so much intense competition making more impressive noises at present. While Vishal Sikka hit the ground running with a whole suite of ideas and innovations, these have largely dissipated over the past year amidst the public infighting. Without consistent financial performances, all the innovations will more or less evaporate and Infy will be left battling it out for low-margin transactional IT contracts. Infosys 4.0 (or whatever it ends up being called) needs a new dynamic CEO, it needs an aggressive sales leader, and a CMO that can articulate what the company is trying to do next and what it stands for. Merely parroting the insufferable fluff about digital and outcomes will not work – Infosys needs to lead India’s innovation, not merely to make up the numbers. On the positive side, any incoming CEO will have a strong set of assets to build on, which have enjoyed significant investment. First and foremost, Infosys analytics and data management prowess, strong products including Finnacle as well as many automation assets integrated into the Nia framework. There has also been solid investments in its US delivery, most notably in Indianapolis and Texas. However, Vishal’s resignation is likely to complete the power shift back to Bangalore. Many of the California-based executives will either jump ship or be pushed out very quickly. The crucial question though is whether the group of Founders will continue to interfere in public or whether they finally take a back seat and demonstrate confidence in any incoming CEO and his executive team. If the latter is not being addressed, any new king will wear very old clothes.